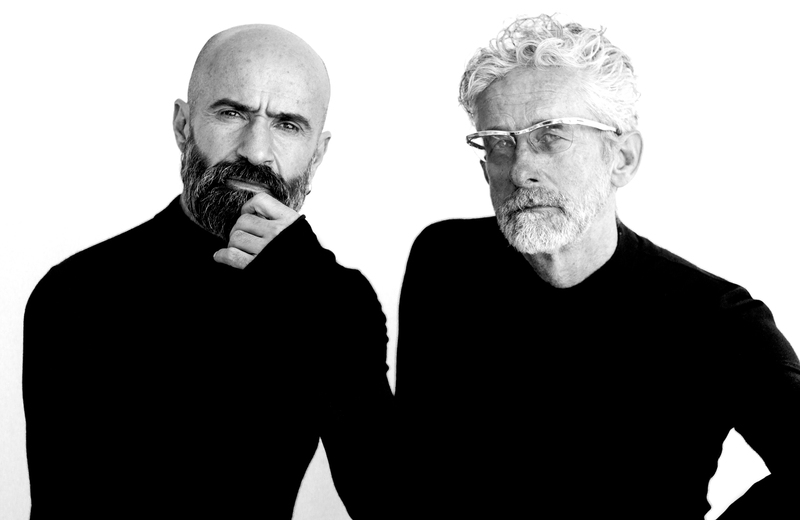 Emio Greco and Pieter C. Scholten, choreographers and founding fathers of ICK met each other in 1995. They soon arrived at the joint realization that something was lacking in the dance landscape at the time. Next to the virtuoso body, on the one hand, and the conceptual body, on the other, they missed a place for the intuitive body. The body that is in movement and that is naturally capable of generating multi-layered meanings by itself. Greco and Scholten sensed the need to develop a new dance vocabulary in which there would be room for vulnerability and for the physical impulses of the body. To both choreographers, the search for a new dance dramaturgy of the body is an important mainspring for their dance productions. In 1995, Greco and Scholten created their first joint work: the solo piece Bianco, which was to become the first part of the Fra Cervello e Movimento (between brain and movement) trilogy. That same year they wrote the manifesto The 7 Necessities featuring 7 principles of dance and the influence thereof on the body and the spectator (see below). In 1996 they established the Emio Greco | PC dance company for which, besides creating choreographies, they initiated research programmes, debates and educational projects. In 2009, Greco and Scholten brought all these activities into the International Choreographic Arts Centre (ICK), from which they were able to offer space for talent development, education and research in a structural setting. From 2014 to 2018, Emio Greco and Pieter C. Scholten were also directors of the Ballet National de Marseille (BNM). Emio Greco (IT) received his dance training at the Centre de Danse International Rosella Hightower in Cannes and began his dancing career with Ballet Antibes Côte d'Azur. From 1993 until 1996 he danced in the work of visual artist and theatre director Jan Fabre and from 1996 until 1998 he collaborated in various productions with Japanese choreographer Saburo Teshigawara. Pieter C. Scholten (NL) studied drama and began his career by directing theatre productions about historical characters such as Oscar Wilde, Yukio Mishima and Pier Paolo Pasolini. He worked as a dance dramaturge with various choreographers. In 1995 he developed the Dance Instants, short work-in-progress projects for choreographers and dancers. After the internationally successful dance productions that Greco and Scholten jointly created between 1996 and 2001, they shifted their focus temporarily to opera, music and film. They directed two operas for the Edinburgh International Festival: Orfeo ed Euridice and The Assassin Tree. In collaboration with Toneelgroep Amsterdam they created the theatre production Teorema. Various interdisciplinary projects led to the production of a triptych inspired by Dante's La Divina Commedia: HELL (2006), [purgatorio] (2008), you PARA | DISO (2010). More recent works, once again focussing primarily on dance, are ROCCO (2011) and Le Corps du Ballet (performed with Les Ballets de Monte-Carlo in 2011, with Het Nationale Ballet in 2013 and with Ballet National de Marseille in 2015). The series The Body in Revolt was launched with the location performance Addio alla Fine in the 2012 Holland Festival. The project received a follow-up with L'Étranger | One Man without a Cause (2013/14) and De Soprano's (2014, in collaboration with Opera Zuid). It was followed in 2015 by the first collaboration between ICK and Ballet National de Marseille that saw 30 dancers on the stage. Extremalism premiered in Theater Carré in Amsterdam in the 2015 Holland Festival. To ICK, the body is a curious and ground breaking body and in particular a social body that is sensitive to social changes such as globalization, digitalization and disintegration. ICK takes the continual changes as its point of departure and employs the body as a window on the world. Via the theme of the body in revolt, the choreographers, dancers and researchers that are linked to ICK make new connections with each other, with themselves (own body) and with society (other bodies). Greco and Scholten have provided an insight into which three factors are essential to ICK in an performance. They sort the reasoning behind their own performances by three elements: spectacle – body – wonder. They recognise these three elements also in the work of the choreographers invited to and supported by ICK. Rhe agitation, disturbance of the peace, visual spectacle and tumult. It is the tear in the canvas, the turning point in the performance. It is the revolt. The stimulant for the brain. The frame of reference by which to attach meaning to dance. It is the overall term for an artistic research into all the possible meanings that a body can express. That which cannot be grasped; the revelation: 'you don't get it, but you feel that it fits'. The mystique. The pure beauty that manifests itself in an interspace. 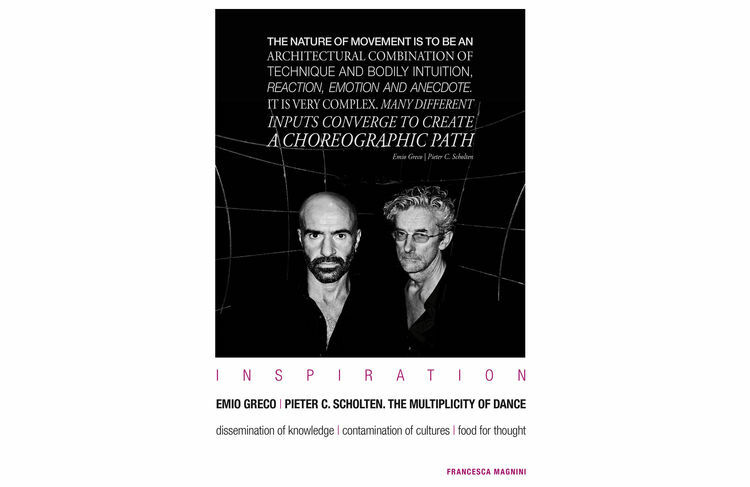 The book 'Inspiration: Emio Greco & Pieter Scholten - The multiplicity of dance' was written on the occasion of the twentieth anniversary of the collaboration of Greco and Scholten and offers both an academic dissertation and a playfully designed outline of important performances of their work, from Bianco (1996) until Extremalism (2015). Furthermore, with reference to the specific approach by Greco and Scholten, the book also addresses the current research into technique, style and vocabulary; principles of choreography; notation; and repertoire building in contemporary dance.